In France indeed, the time of bling bling may well be over. Carla Bruni’s popularity was plummeting–not only was she nicknamed ‘a wannabe Jackie Kennedy’, but her taste for luxury also received increasingly bitter reactions as her country fell deeper in a recession. No one seemed impressed any more with her Chanel suits and Chaumet jewelry. This past weekend, France didn’t only elect socialist François Hollande as its new president; the country also welcomed a first lady – Valérie Trierweiler – diametrically opposed to Carla Bruni. 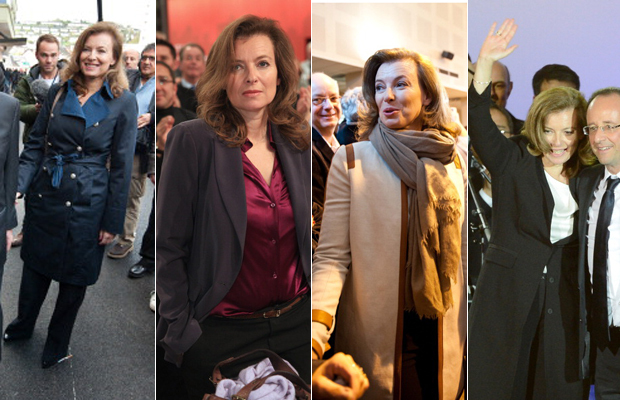 A 47-year-old journalist sans Botox, divorced with three children, she is not François’s new wife but long-term girlfriend–a definite novelty for the Elysée. Valérie has already sold herself as the “anti-Bruni,” preferring tailored professional looks and shopping at markets to sharp sheath dresses and Avenue Montaigne boutiques. Her clothes come from high-street shops and mid-range labels. Her trademark look consists of a trench-coat or a blazer, a simple shirt, ample trousers and small heels. Those are often accessorized by a Gérard Darel handback and a colorful silk scarf. Carla Bruni might have been voted one of the world’s best dressed women by Vanity Fair, but Valérie is the true mirror of French women’s almost unconscious chic.